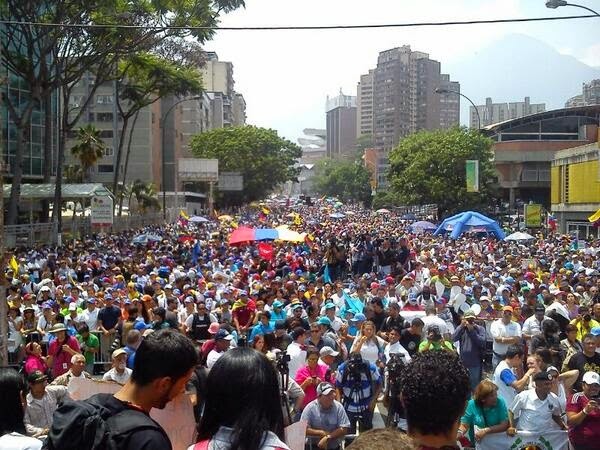 Workers and students joined together in a common front to march for their rights today on May 1, 2014 and in protest against the Maduro regime. On April 28, 2014 Leopoldo López from prison backed the May Day march: "This May 1st lets all go out to protest. Never have there been so many reasons for our workers to manifest themselves." Leopoldo's wife Lillian took part in the march and called for continued action. On April 30, 2014 students, labor unions and guilds gathered together and mobilized tens of thousands for the May Day march with the hashtag: #thestreetwillnotbesilenced. During today's protests dozens of demonstrators were detained by Maduro's security forces. In addition and ominously two human rights organizations had their offices raided today. Today, jailed opposition leader Leopoldo López made public the following letter outlining the situation and calling for a common resistance front. 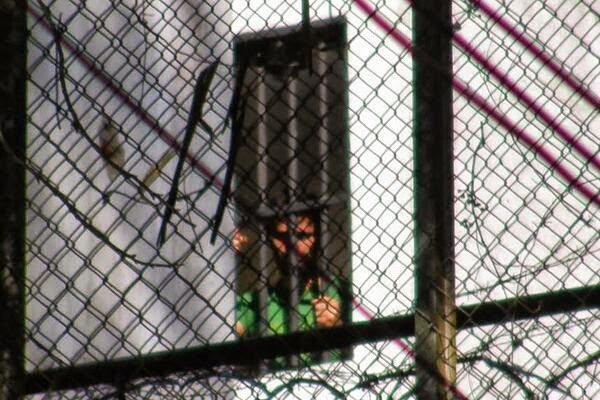 From the military prison in Ramo Verde, where I am unjustly imprisoned by a dictatorship that seeks to silence legitimate protest by workers through blackmail, judicial persecution and labor militias I want to extend my message of firmness and support in the struggle for their claims that is also our struggle. On May 1, 1886 , in the city of Chicago, a front of workers began a day of nonviolent protests in favor of a maximum 8-hour workday under the slogan "eight hours for work, eight hours for sleep and 8 hours for the family. " This peaceful protest was brutally repressed and its leaders executed. But the force of reason ended by imposing itself over the logic of force and a few years later workers won a resounding victory when most of the laws in the world consecrated the 8-hour work day and May 1 went on record as the day of the workers. One hundred and twenty eight years later the government of Nicolás Maduro persecutes, fires and jails workers who refuse to give up their freedoms of association, collective bargaining and protest as mechanisms to improve their living conditions amidst the resounding failure of the socialist economic model and its legacy of inflation, shortages, destruction of national employment and criminalization of public protest including those of the workers. The minimum wage, even after the insufficient increase announced by Maduro, is the lowest in the region. 85 dollars compared to 487 in Panama , 300 in Colombia, 338 in Ecuador, 265 in Peru and 171 dollars in Bolivia. Only in Cuba , where workers are unfortunately a sort of slave labor exploited by the Cuban government , the minimum wage is lower than in Venezuela (10 dollars) . The shortage exceeds 30 percent and workers and their families are denigrated and make long lines to buy commodities. Inflation in food reaches the inhuman figure of 80 percent. In recent months, it has paralyzed much of the national productive apparatus as a result of the lack of foreign currency that for years were devoted to an unsustainable expansion of imported consumer goods at the expense of domestic production. Today, the dictatorship mocks employers and employees in the national economy with promises of a currency that never arrives while there are plants stopped and workers in their homes. It is the consequence of an economic production model at odds with production and national employment and addicted to imports that has served to buy the loyalty of governments who, in exchange for getting markets for their products, are willing to tolerate in Venezuela an autocratic regime they would never accept in their countries. I do not hesitate to say that the big losers of the disaster of Maduro have been Venezuelan producers and workers. But its not only the dismal performance of the dictatorship, which should unite in this fight. It is above all the systematic violations of freedom of Venezuelan workers , especially our public workers union. The right to bargain collectively in the State is in practice suspended and who raise their voices for the enforcement of contracts or the precarious state of public companies are dismissed, prosecuted and jailed . Representatives of the workers are marginalized from the social dialogue. The vast majority of workers rejected the application of a socioeconomic model that keeps basic political and trade union freedoms confiscated. They are trying to impose in Venezuela the Chinese - Cuban model: cheap labor and without rights in service to the State and international capital. Trade union freedom can only exist in the context of a democratic and pluralistic model of labor relations in the framework of the Rule of Law that guarantees the full exercise of all civil liberties and rights of all. Trade union freedom is an illusion when one is before a government that in addition to employer is labor inspector, judge, police and electoral rector and uses all its power to destroy the autonomy of trade unions and place them in service of the failed project . I am convinced that economic and social progress of all Venezuelans is only possible to achieve in a climate of civil liberties and that necessarily involves the articulation of all political and social forces in a common front that would achieve a substitution of the dictatorship led by Nicolás Maduro, through peaceful and constitutional means . Workers and students must be at the forefront of the front along with the political parties. Today those of us who believe and are ready to defend freedom must unite in the same struggle . Freedom is indivisible and only fighting for it together can we conquer it. Freedom when it starts to disappear when it is most needed, and in Venezuela the lack of freedoms is a reality that affects millions of Venezuelans every day. Let us unite in one front in the same struggle and in the same purpose: that all rights be for all the people , without exceptions and without privileges.